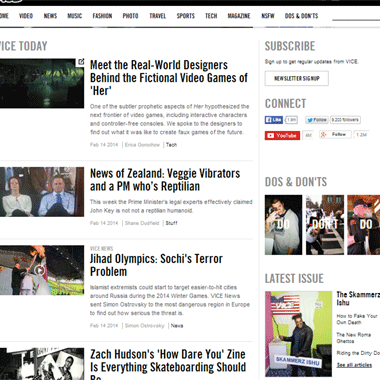 A Little About Vice News Site : Vice started as a monthly magazine publication in 1994 featuring articles based on arts, music, pop culture, and news events. Vice magazine is a prime example of Immersionist journalism, which aims to break the mold of typical mainstream journalism conventions. A whole issue would often be centred around a specific topic or theme, ranging from “The Fashion Issue” to “The Cultural Atrocities Issue”, and just about anything found in between. They expanded their reach to the world in ’96 with the birth of viceland.com, and in 2011, moved to vice.com. Their articles and videos are offbeat and varied, with an apparent emphasis on avoiding duplicate coverage of stories trending on one of many News Corp. outlets. You can take a sneak peak at tomorrow’s technology creeping up through the woodworks, browse through confronting war photographs from abroad or if that’s not your thing, perhaps a little light hearted fun at the Winter Ferret Fandango. Maybe treat your ears to a new tune from an artist you might have never heard before. It’s as if Vice takes the current cultures and events of fringe societies and pulls them all together under one big circus tent. And while that may sound somewhat chaotic, it’s easy to navigate between the contrasting stories, or browse within a familiar vein. You’ll see a link to an article for the Bill Nye versus Ken Ham debate mingling amongst links to stories like “The man who is always drunk because his body produces it’s own alcohol” or the one about that Colorado woman who let a puppy drink milk from her breast. Even the writing style of articles vary as much as their topics, thanks to a big list of contributors who submit their articles to the site & magazine. There’s a strip of categories at the top of the site to steer you in the direction you want, and a typical search function to dig through the archives. All that said, Vice isn’t made for the stereotyped neck beard hipster who only listens to some obscure Slovakian avant-garde cyber-funk on a modified gramophone running the latest iOS. It’s made for just about anyone: the sports fans, the fashionistas, the music lovers, pop culture nuts, or those who are sick of the same old crap sliding it’s way down the tubes of the information superhighway onto their social media feeds. It’s made for just about anyone: the sports fans, the fashionistas, the music lovers, pop culture nuts, or those who are sick of the same old crap sliding it’s way down the tubes of the information superhighway onto their social media feeds.